This happened to me on Friday. My system slowed way down and got very laggy. Check Task Manager and Resource Monitor. My C: SSD was at 100% utilization. The culprit, compatTelRunner.exe. This is apparently something that was used for Win7 compatibility checking for Win10. I’ve got Win10 and this wasn’t an upgrade. Anyway, you can disable this via task scheduler. Click Start, then type task scheduler and press Enter. In Application Experience, find Microsoft Compatibility Appraiser. Right-click Microsoft Compatibility Appraiser and select Disable. Kill any comptelrunner.exe tasks running and your system should become usable again. I was trying to find an icon for this to put in a document, but couldn’t find one with the circle and all 4 arrows, so I made my own. In case anyone else needs one, here you go. It’s not perfect, but good enough for internal tech docs. One thing I really had grown accustomed to is the Quick Launch menu and easily opening multiple Windows Explorer windows across my 2 and 3 monitor setups and seeing the Drives view. Both of these have been noticeably missing since Win 7. Is Windows Virtual PC supported on Windows 8? Windows Virtual PC will not be supported on Windows 8. Client Hyper-V is Microsoft’s offering for operating system virtualization on Windows 8. 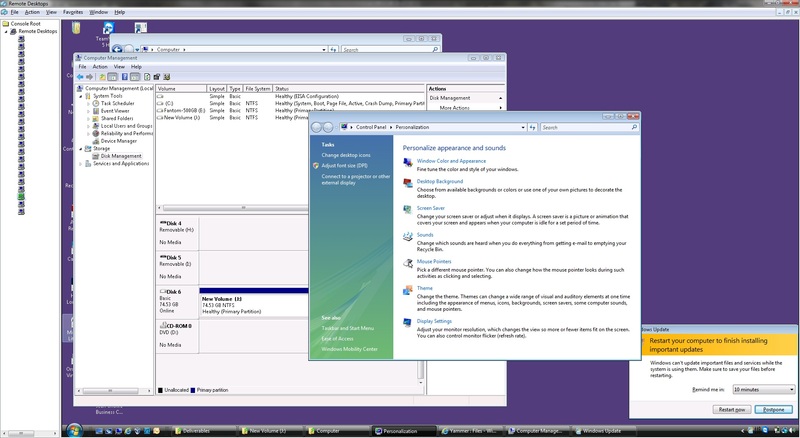 To learn how to retrieve data from a Windows XP Mode virtual machine on Windows 8, click here. The Windows 7 USB/DVD download tool is a great little utility I just discovered (its been around for years, but I never found it) when googling for a tool install Windows 7 from USB. In short, you can easily take a Windows ISO image and quickly make a bootable USB flash drive to install Windows. This is the first thing I’ve gotten from the Microsoft store and if this is the type of things they’ll have, I’ll definitely be a fan! Now from the command prompt, change to your mounted Windows 7 installation ISO or DVD drive. If your ISO is mounted to V:, change to the V: drive. type “bootsect /nt60 x:” where x: is the drive letter of your USB drive. You should get a “successfully updated ntfs filesystem message” if it worked. finally, copy all the files from the DVD/ISO image to the USB drive. I picked up a refurbed Dell ST from Dell’s outlet figuring it would be a nice little Win7 slate to go along with my aging Toshiba M400 convertible. My M400 was a wonderful tool when I returned to SFSU to complete my computer engineering degree. I used it to take notes, annotate PDFs from class, and complete homework. I was in for a huge disappointment. The ST is woefully underpowered with it’s Atom CPU and 2GB of RAM. I have the 32GB SSD version. There are no buttons except power, volume, and a rotation lock. Get stuck on boot, need to “press any key,” “f1” or “f2” and don’t have a USB keyboard handy? You’re out of luck! Compared to an iPad or Android tablet its slow, hot, has an inaccurate touch and pen digitizer. If you want to run Aero, forget about doing anything else. Switching Performance setttings makes it usable.